It’s hard to overstate the health benefits of walking at least 30 minutes a day. On top of that, strolls around the neighborhood can help clear your mind, loosen stiff muscles after long bouts of sitting, and give you a boost of much-needed energy. 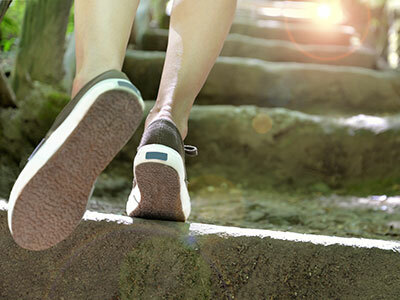 Before you pull on your shoes and head for the door, however, check out tips from Danny and Katherine Dreyer, authors of CHIWALKING, on how to prepare for your daily walk. Here’s a tip to remember: the better you physically set up your body before going out for a daily walk, the more enjoyable and fulfilling your entire walking program will be. If you set up the right conditions for a good walk, you’ll likely have one. Or, if you feel any resistance to going out for a walk, moving forward in small preparatory increments makes getting out the door easier. Here are a few things to prepare your body for ChiWalking. Hydrate sufficiently. Be sure to drink plenty of water all day and especially before, during, and after walking. The movement of walking helps your body to eliminate toxins and water helps to flush that cellular waste out of your system. It is recommended that the average person consume ten 10-ounce glasses of water every day. That’s a lot to keep up with and even more important to do if you’re a regular walker. I carry a refillable plastic water bottle with me all day long. It holds 20 ounces and I try to drink four or five a day. The rule I go by is: if your pee is the same color as a taxicab, you’re not drinking enough water. Fueling. Unless you’re planning on walking for more than two or three hours, or you’re diabetic and need to keep a close eye on your blood glucose levels, there’s really no need to take food of any kind with you when you walk. I’ve never heard of anyone dying of starvation while walking, except for some guy who was trying to reach the South Pole. If you focus on food while you’re walking, you’re focusing on the wrong thing. Experiencing Nature in all its glory or working on your technique will keep your mind and your body plenty busy. Don’t do vigorous walking right after eating. But taking a leisurely stroll to digest is a great idea, especially if you’ve just eaten a huge Thanksgiving dinner. Then it’s good to get out and walk to counteract all of that tryptophan and to get as far away as possible from tempting thirds. Wear good shoes. I know this should be obvious, but you’d be surprised at how many people I see walking in shoes that either are too stiff or have elevated heels. Neither of these will do your feet or legs any good. Your shoes should be comfortable and should fit like bedroom slippers. Don’t lace them too snugly or you risk irritating your arches. Do some prewalk body looseners. I do these religiously before every walk or run. They serve to relax your muscles and loosen your joints so that your walking will be more fluid. As I’ve mentioned previously, chi flows more readily through joints that are open and relaxed. So if you want your ChiWalking to do what it is meant to do, start each walk with a set of body looseners. I never stretch before I walk (find out why in the section on stretching). 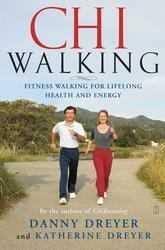 For step-by-step instructions on how to mix up your daily walk with variations such as the Cardio Walk, Upper Body Walk, and Calming Walk, pick up a copy of Danny and Katherine Dryer’s book ChiWalking. Stiff and sore from sitting for too long while working or traveling? This simple “Loosening Walk” will leave you feeling refreshed from head to toe. Excerpted from Chi Walking by Danny Dreyer and Katherine Dreyer. Copyright © 2006 by Danny Dreyer. Used by permission of the publisher. All rights reserved. From the authors of the bestselling ChiRunning comes a revolutionary program that blends the health benefits of walking with the core principles of T’ai Chi to deliver maximum physical, mental, and spiritual fitness.